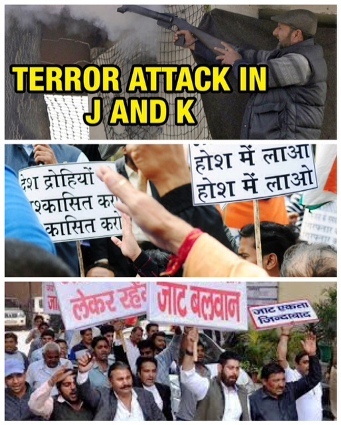 Presently, the nation has three major challenges before it – first- frequent attacks on security forces in Jammu and Kashmir by the terrorists, second – anti-national slogans by the students in Jawahar Lal Nehru University (JNU) and supporting against them one class of the University and third – JAT agitations in Haryana in the name of reservation and confrontation between Jat and Non-Jat. No doubt, all these three challenges could be seen in different states of the country but in case go deep in to the problems, these three are prime challenges and there is no permanent solution because of roots of these problems – terrorism, racism and reservation – is in politics. India is a secular country as per its constitution but the fact is that the political parties in view of their vested interests, don’t see the people rather treat them practically, on the basis of religion, caste and creed. It might look awkward to you but the ground reality is that the political parties have divided the nation in three major categories – Hindu, Dalit and Muslims. All the three communities are capable to impress the politics primarily and to get support and grab the power of big chairs from them, the politicians go to the extent of putting the interests of the nation at stake even. The nation has neither been able to have permanent solution to the problem of Jammu and Kashmir even after 69 years of independence of India nor initiated the concrete steps. Not only this, India is still following the peace path and concentrating on dialogues only with the Pakistan with the result, the Jammu and Kashmir is still a disturbing area following by Punjab where the intruders entered in Indian Territory in Pathankot. The day the Jawahar Lal Nehru University has come into existence, the ‘leftist ideology’ has been working in the campus which is being run with the financial assistance of Central Government. It is not a crime about the existence left-wing ideology as the difference of opinion is natural in a democracy but if someone is making the difference of opinion as a tool of conspiracy against the country, cannot be tolerated. What has happened in the past in JNU campus – shouting slogans against the nation and challenging the democratic system of the country through provocative statements and people are watching it helplessly, is not a days’ work but it must have took years to plan it but no action has been taken rather preference has been given to the political benefits. It is only because of political pressure that the national interests are being ignored for political gains in the valley. Congress and Leftists are speaking in a same tone and anti-national powers are looking for shaking hands with them. The recent Jat agitations in Haryana, without any doubt, have put the vigorously progressing state at the back foot because of weak administration and for not taking timely decisions by the political leadership. The Jat agitation in Haryana has put a blot on the state which would be difficult to wash out in the near future by the Haryanivis. Despite giving assurance to the leaders of jats in Haryana that the government is ready to accept the reservation demand but legal process has to be adopted for which a time is required, the agitation was continued. The result is before us that now jat and non-jats have been divided. There had been losses in Punjab, Haryana, Delhi, Himachal Pardesh and Uttar Pardesh to the tune of around Rs.20,000 crores but the protests are still going on because of having political support. Whatever may be problems in the country - may be terrorist, racism, reservation or corruption - the game changer idea is only the interests of the political parties. Frankly speaking, the need of the hour is that the game of politics should be played safely keeping in view the interests of the nation. Compromise at the interest of the nation is a compromise with own death. If we want to keep secure our present and future, we have to learn the art of living and dying for the country. Racism, terrorism, reservation, corruption – all these are obstacles in the development of the country and challenges as well. Only be crossing them, we can give a strong India to the next generation. We should not forget that our survival is with the existence of nation and our respect is with the honor of our nation.